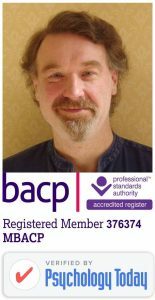 Ian Pittaway, B.A. (Hon. ), P.G. Cert., P.G. Dip., Registered Member M.B.A.C.P. It is likely that you are viewing this website because you are in distress, with unresolved issues you wish to address. If so, please be assured of a warm welcome on deciding to take that first step. I hope this site gives you the information you need. I work with all of life’s difficulties, and also specialise in personal trauma, including post-traumatic stress, anxiety, depression and complex bereavement. 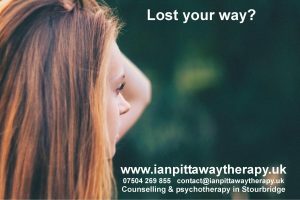 I am a counsellor and integrative psychotherapist in the West Midlands, operating in Stourbridge, easily accessible to surrounding areas such as Kingswinford, Dudley, Kinver, Halesowen, Wombourne, Brierley Hill, Kidderminster, Wolverhampton, Birmingham, Bromsgrove, and Hagley. This website describes my approach, addresses some frequently asked questions, outlines my commitment to privacy, lists my fees, and has short therapy articles, intended to be helpful for the general reader.